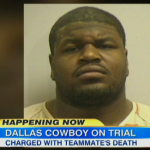 Dan appeared on Good Morning America Tuesday, January 14th to discuss the trial of ex- Dallas Cowboy football player, Josh Brent, who is accused of intoxicated manslaughter in the death of his friend and former teammate. If convicted Brent can face up to 20 years in prison. The defense is arguing that because of Brent’s size, he was not actually intoxicated. Says Dan, “It’s not a particularly effective defense, someone who is 300 pounds just has to drink more to get to that same level as someone who’s 150 pounds. Once you get that number, that .18, that’s already incorporated your size. Typically, when you’re in the position he is in, you want to get blood alcohol tests, thrown out before the trial, you see that a lot because they say, it was unreliable, there were various problems, ect. They didn’t succeed, they’re still trying to have the jury minimize that but they’re in a very tough spot”. Watch the full clip here.